OSSI Partner Seed Companies sell OSSI-Pledged varieties, acknowledge the OSSI breeders in their variety descriptions, label OSSI-Pledged varieties with the OSSI logo, and include the Pledge and information about OSSI in their catalogs and on their websites. The Seed List of OSSI-Pledged varieties gives complete descriptions and photos for each OSSI-Pledged variety and links to every OSSI Partner Seed Company that carries each variety. Through its educational and outreach activities, OSSI creates awareness of the value of purchasing “freed seed” and guides customers to its Seed Company Partners. OSSI is thereby creating a market for ethically produced, “freed seed” analogous to the markets for “fair trade” and “organic” products. There is a role for you in the OSSI community. Sign up for the OSSI quarterly e-newsletter. Go to our Get Involved page to join as an OSSI partner seed company, or, if you are a plant breeder, to Pledge a variety. Make a donation to support our work. 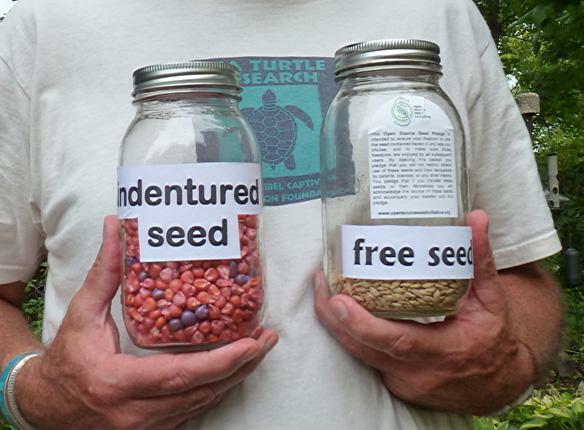 Join with OSSI and help OSSI free the seed! Irwin Goldman is a professor in the Department of Horticulture at the University of Wisconsin-Madison. His research focuses on vegetable breeding and genetics (carrot, onion, and table beet) with an emphasis on plant secondary metabolites that have some potential value for human health and wellbeing. He has also bred numerous cultivars and inbred lines that have been used to make commercial hybrids. These are grown by farmers throughout the world. A portion of the germplasm from his program is licensed through WARF and returns royalties to the breeding program. His program currently has over 75 active germplasm licenses. In recent years, Irwin and colleague Claire Luby have released eight carrot populations into OSSI that were developed under organic conditions. His breeding program includes work to improve horticultural traits in organic environments. Irwin was a part of the group who helped conceptualize and organize the first Student Organic Seed Symposium. Irwin teaches five courses at UW-Madison, including world vegetable crops, principles of plant breeding, techniques of plant breeding, evolutionary biology, and plants and human well being. He is currently serving as department chair and works with both graduate and undergraduate students in a variety of research and outreach projects. Alejandro Argumedo is Program Director of Asociacion ANDES, a Cusco-based indigenous peoples’ non-governmental organization working to protect and develop indigenous peoples’ Biocultural Heritage. Alejandro is a native Quechua founder and coordinator of the International Mountain Indigenous Peoples Network. He is also a founding member of the Indigenous Peoples’ Biodiversity Network (IPBN) and the Call of the Earth Group, global coalitions of indigenous peoples working towards the shared goals of protecting and nurturing biodiverse food systems and protecting their bio-cultural innovations and intellectual property. He is the current President of the Global Coalition for Biocultural Diversity of the International Society of Ethnobiology, former Executive Director of Cultural Survival Canada and the Indigenous Knowledge Program. He graduated from McGill University, Montreal, Canada in Agriculture. Alejandro has written extensively on diverse themes such as genetic resources and community-led conservation, indigenous agriculture, climate change, biocultural landscapes, has served in expert panels of the UN and other relevant bodies, and has been consultant for various international institutions. Oregon plant breeder Carol Deppe holds a PhD in Genetics from Harvard University and specializes in developing open source crops for organic systems, superior flavor, agricultural resilience, and human survival for the next thousand years. She is author of Breed Your Own Vegetable Varieties: The Gardener’s and Farmer’s Guide to Plant Breeding and Seed Saving, The Resilient Gardener: Food Production and Self-Reliance in Uncertain Times, and The Tao of Vegetable Gardening: Cultivating Tomatoes, Greens, Peas, Beans, Squash, Joy, and Serenity. Carol is founder and owner of Fertile Valley Seeds, and has contributed 20 OSSI-Pledged varieties of flint corns, flour corns, dry beans, chickpeas, cowpeas, and squash. For seeds, books, and articles see www.caroldeppe.com. Jack Kloppenburg is Professor Emeritus in the Department of Community and Environmental Sociology at the University of Wisconsin-Madison. He has studied the social impacts of biotechnology, the controversy over control of genetic resources, and the prospects for framing food sheds as an analytical basis for developing sustainable food systems. He is the author of First the Seed: The Political Economy of Plant Biotechnology, 1492-2000 (Cambridge University Press). He is currently jazzed by the potential of food sovereignty and by the possible application of open source principles to plant breeding. He is a founder of the Open Source Seed Initiative. Tom is a faculty member in the Department of Horticultural Science at the University of Minnesota – Twin Cities. His current research activities focus on the genetic diversity of heirloom dry beans and breeding new dry bean cultivars for organic production systems. His urban outreach activities highlight a unique piece of outdoor furniture he recently designed called the Hydroponic Salad Table. This compact structure offers city dwellers a convenient and highly productive system for growing salad greens on an outdoor balcony. He is currently selecting new and diverse salad green cultivars specifically for use in the Hydroponic Salad Table. Tom teaches several undergraduate and graduate courses each year on subjects ranging from plant science to edible landscapes and conducts pedagogical research on the use of augmented reality in experiential learning. He is thrilled that his earlier concept of General Public License for Plant Germplasm has been incorporated into the broader mission of the Open Source Seed Initiative. Jonathan and Jessie Spero started Lupine Knoll Farm in 2001 with the purpose of improving vegetable varieties and offering for sale open pollinated organic vegetable seeds. Lupine Knoll Farm consists of three small fields totaling about 6 acres located in the Applegate Valley of SW Oregon. New cultivars of open pollinated sweet corn are in the works, the first of which “Top Hat” will be released soon, with Tuxana, Ana Lee and Festivity to follow. Jonathan also selected Solstice broccoli from mixed stock provided by Oregon State University in 2002 as a part of the Farmers Cooperative Genome Project. He selected Siber Frill kale from mixed stock provided by Peters Seed and Research, and selected Emerald Fan lettuce from mixed stock provided by Wild Garden Seeds. Jonathan is a part of the Family Farmers Seed Cooperative and sells lettuce, kale, squash, tomato and other seeds to several small seed companies. Jahi Chappell served as a founding board member of OSSI from 2014 to 2017 while he was Senior Scientist and Director of Agroecology and Agriculture Policy at the Minneapolis-based Institute for Agriculture and Trade Policy. He is currently a Senior Research Fellow at the Centre for Agroecology, Water, and Resilience at Coventry University in the UK. There, he conducts collaborative transdisciplinary research and connects with communities in order to analyze, coordinate, and develop actions and policies to create a sustainable, decentralized, and deeply democratic food and agriculture system. He was previously an assistant professor of environmental science and justice at Washington State University. He has worked with and consulted for groups like La Vía Campesina, the Secretariat of Food and Nutrition Security of Belo Horizonte (Brazil), the Food and Agriculture Organization (FAO), and the urban agriculture nonprofits Growing Hope (Ypsilanti, Mich.) and Growing Gardens (Portland, Ore.). He holds a Ph.D. in Ecology and Evolutionary Biology and a Bachelor’s of Science in Chemical Engineering from the University of Michigan, and conducted postdoctoral research in Science and Technology Studies at Cornell University. He is a past Chair of the Agroecology Section of the Ecological Society of America. His first book, Beginning to End Hunger, will be published by University of California Press in 2017.